What's a home's selling point? A gracious living room with a stunning fireplace and original moldings that capture its natural elegance? A private deck that spills onto a lush backyard lined with maple trees? Country charm just steps from the heartbeat of the city? Well, one house in real estate agent Jake Palmer's portfolio has all of this -- but he's not banking on any of those features to land a buyer. Instead, he's advertising the home's less obvious virtues: no ghosts, indoor plumbing and, of course, fog resistance. To spice up a listing that has gone stale for months, Palmer, a RE/MAX agent based in Saint John in the Canadian province of New Brunswick, decided to use humor to light a fire under prospective buyers. 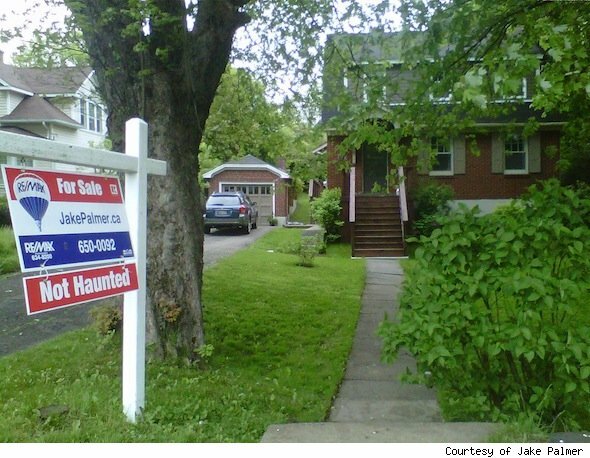 He's been posting signs in front of the home that say "not haunted," "indoor plumbing" and "fog resistant." There's also: "It's a brick, house" and "love shack, baby!" "[The owners] looked for some unorthodox way to grab attention," Palmer said, adding that the house had gotten no prospective buyer traffic for a couple of months. He had created one of the signs as a gag long ago, so when he was looking for a way to breathe new life into the listing, he drew from that inspiration. And the response was overwhelming. "People were stopping, taking pictures and sending them all over Facebook," Palmer said. They've also captured the attention of media outlets everywhere, including real estate blog Curbed and The Wall Street Journal. The signs have worked so well that Palmer is even planning to add a new one to the rotation that says "batteries included." The most important thing the signs have helped do is dispel buyers' fears about why the house has sat on the market for so long, Palmer said. "The perception that there's something wrong with the house is now gone," he said. And since he began putting up the signs last month, Palmer said, the number of showings he's scheduled has skyrocketed, along with "open houses with a lot of traffic." But Palmer does admit that he has a certain buyer in mind: "Our secret hope is that Ellen Degeneres will buy the house." Know of a homeowner or Realtor who has used a particularly unusual tactic to sell a home? Send us a tip at graham.wood@teamaol.com.